His face tells the tale of just how tough and demanding the Stanley Cup Playoffs are. 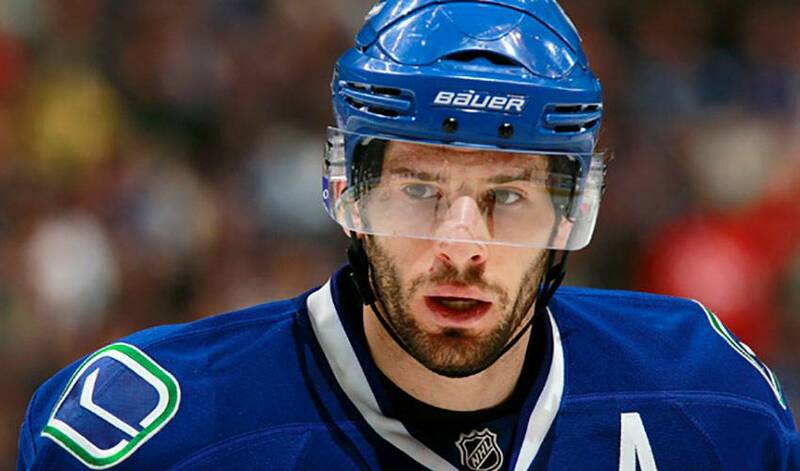 But Ryan Kesler, Vancouver's Mr. Everything, isn't bemoaning the bruises, bumps and welts that come with the territory. He's once again a Selke Trophy finalist and his name is also being bandied about as a top contender for the Conn Smythe Trophy as the NHL Playoffs most valuable player. But it hasn't been all rosy for one of hockey's most complete players. During Game Five of the Canucks' second-round set against the Nashville Predators, Kesler took a deflected puck to the chin, resulting in stitches and the loss of one tooth. On this day, though, just two days removed from Vancouver's conference semifinal victory, Kesler can find some humour in the look he's sporting. And there's still work to be done for Kesler and his Vancouver teammates as they continue their push towards delivering the franchise's first Cup triumph. While there's plenty to speak of when it comes to his contributions this post-season, be it his scoring touch or picture-perfect set-ups, the player who had 15 points in 13 games heading into the Canucks Western final date with the San Jose Sharks, isn't overly keen when the subject turns to his own performance. Plenty of people are, however, including his teammates. From defenceman Kevin Bieksa, to forward Mason Raymond, to goaltender Roberto Luongo, each and every Vancouver player has rave reviews for Kesler, never needing to be prompted when it comes to No. 17. Nashville head coach Barry Trotz compared Kesler to Mark Messier, one of hockey's all-time great performers and leaders. But is he happy with the way he's played so far? “I'm happy that we made it past the second round,” chuckled Kesler. Kesler, who played minor hockey in Detroit for teams such as Compuware, Honeybaked, and Little Caesars of the Midwest Elite Hockey League, once considered calling the game quits when he was around 15. But his competitive drive and willingness to work overtime on every part of his game pushed him to forge on. He's certainly happy at the decision he made. He also knows that he has and always will be his own harshest critic. Kesler is, however, thrilled with the way the team has performed in the playoffs, including the effort of Jeff Tambellini in Vancouver's 2-1, series-clinching win over Nashville. When a Predators' forward broke free and bore down on Luongo, Tambellini took up the chase, tracked him down, knocked him off the puck and prevented a high-percentage scoring opportunity. And while unbelievable is an apt way to describe Kesler's play, the 6'2”, 200-pounder doesn't like to go down that road. Still, he admits it's somewhat humbling to see his name and number on the backs of the Canucks' jerseys fans are sporting. And anyone that gets to watch one of hockey's best two-way stars working his magic will certainly have plenty to talk about. That's just the way Ryan Kesler would prefer it.